Sun exposure during hot summer months can cause problems not only for you, but also for your horse. Many horses, especially those with white markings on their heads, can be victims of sunburn. Mild sunburn is not a cause for alarm, but may necessitate sunscreen and/or fly mask application, and night turn out. Horses can also be affected with photodermatitis, a reaction in the skin that occurs from UV light exposure. There are two conditions that cause a horse's skin to be abnormally sensitive to sunlight (photosensitive). Primary photosensitivity occurs when a horse is exposed to a chemical that causes the skin to be more sensitive to UV light. This can occur from contact with chemicals (fly sprays, coat conditioners, etc.) or drugs (certain antibiotics and tranquilizers). Ingestion of certain plants can also cause photosensitivity. Clover, St. John's Wort, Rye, and other weeds and grasses are digested by the horse to produce substances that reach the skin and cause sensitivity to sunlight. Secondary photosensitivity occurs when the horse has underlying liver disease that allows photosensitive pigments to accumulate in the body. Liver disease can be caused by infection, toxins, or cancer. Signs of liver disease are nonspecific and can include lethargy, decreased appetite, weight loss, and yellow color of the eyes and gums (jaundice). Photodermatitis usually occurs on non pigmented areas of skin, especially where your horse has white markings on their face and lower legs. Horses with photosensitivity will exhibit redness, swelling, scabs and crusts. 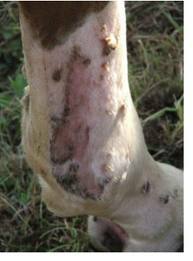 Owners may see their horses scratching the affected areas. More severe cases can have open draining sores and peeling skin. Your veterinarian will want to obtain a full history about your horse's care, and perform a complete physical exam. The hay and pasture should be inspected for signs of plants that may cause photosensitivity. Affected horses should be removed from sunlight. The areas of affected skin should be cleaned with antiseptic soap daily and if needed, a cream such as Desitin can be applied to soften the scabs and soothe the skin. In severe cases, steroids can be administered to decrease swelling and irritation. Antibiotics may be needed if there is a secondary skin infection (dermatitis) present. If your veterinarian suspects liver disease, blood work should be run to evaluate liver function. If the liver is affected, further treatment will be warranted. If you believe your horse may be suffering from photosensitivity, please call our office to consult a doctor and set up an appointment.